A couple of significant things happened in the final quarter of 2012. My account maintained sustainability and I stopped contributing to the account (temporarily). I’ll go over each in turn, but the first is a milestone that I have been waiting for, while the second was something that just needed to happen because of my personal financial situation. What defines sustainability? For me, I’ve defined it as receiving in excess of $25 a month in principle and interest payments. My account first reached that goal in June of 2012, and has maintained it since. In August of 2012, it came close to dropping below that threshold, but managed to stay above. It seems to have settled in at about $30 towards the end of the quarter, so hopefully as that money is reinvested, that number will continue to increase. I stopped my contributions to the account in November. If you’ve been reading along with the site, you’ll know that we ended up having some financial difficulties at the end of October. As a result, much of the money that I was using to fund the account ended up getting transferred to my personal account to help dig ourselves out of that rut. It isn’t any reflection on Lending Club, but a reflection on my finances and the need to help keep the ship afloat. We’ve mostly righted the ship, now, so I’ll likely start putting some money back into this account sometime in the first or second quarter of 2013. My portfolio remains strong. I still haven’t had any defaults. *knock on wood* While this experiment of sorts (it’s gone beyond that, I think) started in July of 2011, I’ve had my account at Lending Club since January of 2010. That’s a pretty long stretch to go without a default of any sort. You might recall that I sold a loan that had gone delinquent in the 2Q/3Q 2012 area. I also had a second loan that had gone late, but it eventually was made current. Currently, my portfolio has 42 loans in it. All of them are current. It also has 13 loans that have been paid in full. Of those, perhaps about half have been paid off in advance. That’s both good and bad. I like that they’ve paid them off in advance because it seems to show that the borrowers are perhaps getting their finances together. It’s bad, because I lose out on some income from interest when they pay them off early. One of the risks of this income stream. I’m still not able to directly invest in loans, and still have to invest through the FolioFN platform. It’s still not ideal. But, until my state (North Dakota) pulls their head out, and starts allowing it, that’s what I’m stuck with. I’m not holding my breath. I’m not going to complain too much, as I do seem to have found a pretty good method for selecting my Lending Club notes, and it seems to be working. How are your investments starting off the new year? 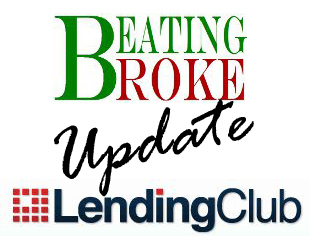 How’s your Lending Club (or Prosper) account doing?